Rabbi Nachman (some say also the Koztker Rebbe) say that there is nothing more whole than a Yid with a broken heart. ASJ, can you please ask R. Yoni where Rebbe Nachman says this? It is well-known that this was said by the Rebbe Menachem Mendel of Kotzk. If you are a Breslover Chassid, then it is appropriate to refer to this tune as "Rabbeinu's Niggun." But if you're a Sudykover, Vishnitzer or Modzitzer [etc.] Chassid, it is more appropriate to refer to it as "Rebbe Nachman's niggun." In Modzitz, there are hundreds of heart-rending niggunim. It's worthwhile coming to Bnei Brak to check them out...or at least, acquiring a few disks of theirs! Interestingly, part of Bartok's Rhapsody No. 1 for violin and piano (also the version for violin and orchestra) contains a tune much like part of this niggun. Bartok went around eastern Europe collecting folk tunes; I wonder if he ran into chassidim singing the niggun. Could you ask Yoni Lipshutz to comment? Yitz & Bob Miller: Perhaps Yoni will respond to your question once he sees your comment. I sent him the link this morning. Yitz: I refer to it as "Rabeinu's Niggun" because that is what it is titled on the CD. As for the niggunim of Modzitz, what CD do you think is best and best representative of Modzitzer niggunim? I look forward to Yoni's response. I recommend the 4-CD set, "Modzitz Chai." If you want to start with only one, then number 4 - "Niggunim she'kulam Ohavim," has an amazing variety of niggunim that are all great!!! ASJ: Yes, that's the one! Do you know anything about it, and where I might find the video clip they refer to? (I'll check Google video). As for the Shabbos in Mezbibuz CD, I too saw it advertised, but do not know anything else about it. Yitz! Rabenu HaKadosh refers a lot of times to the broken heart. I dont know exactly if he said that there is nothing more whole than a Yid with a broken heart, i think it was the Kotzer, but in Sichos HaRan ("Rabbi Nachman Wisdom")#41, #42 and #45 you will see what rabenu said about a broken heart. Aien Sham. ASJ, today, im irtze H' i going to creat a blog (whit your styles, Tora, guedolim pics and other things), any advice? Ilan: Send me the link when it is up. I will be sure to provide a link to it. Original minhog of Breslover Chasidim is to sing Rebbe's nigun without words (especially on sholosh seudoys and before a maymor). Some sing with words, but real beauty of the nigun is apparent when sung without. Such wordless nigunim (dveykus nigunim) are an important part of chasidus and avoydo as taught by Baal Shem Tov and his talmidim. Dveykus nigunim are without words because they are higher than words (speach) and express what words can't express. This particular nigun Reb Avrohom Shternhartz ztz"l brought to Eretz Yisroel, and said that he received a mesoyro about it from Tcheriner Rov zy"o. Well...here im whit the new blog. if anyone have some idea or advice, just tell me. At the Shalosh Seudos I sometimes attend here in my neighborhood in Yerushalayim, R. Moshe Beininstock sings Rebbe Nachman's niggun to "Yetzaveh Tzur Chasdo," then they sing two more niggunim, before learning from Likkutei Moharan. My son, who has been to Breslov Shalosh Seudos in many locations [Bnei Brak, Tzfat, etc.] tells me that as far as he can remember, all of them sing it to "Yetzaveh." A Yid & Yitz: I appreciate the background information on this niggun. Ilan: I just added a link. yitz: As I said, original tradition is to sing it davka without words. Not every one is keeping it though. However all talmidim (and talmidey talmidim) of Reb Avrohom Shternahrtz ztz"l (who brought this nigun) are very particular to to it so (without words). For example listen how it is sung in Tzfas by Reb Luzer Kenig, or in "Oyr Avrohom" shul by Reb Nachman Burshteyn in Yerusholaim. 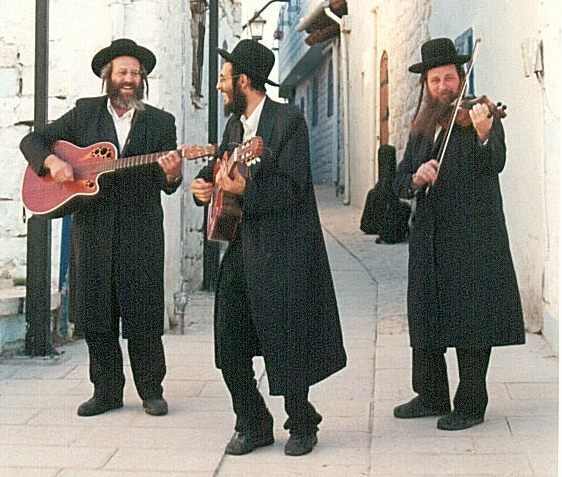 In Breslov many mesoyros were lost because of some strange lack of interest to them from the part of breslovers in Eretz Yisroel, and some hefkeyrus on the other hand. My personal experience is, that only talmidim of Reb Avrohom Shternhartz ztz"l were very careful to preserve real Breslover mesoyro, because he himself was, and because he was yochid be-doyroy as baal hamesoyro in Breslover Chasidus. Reb Levi Yitzchok Bender z"l first combined the "Rebbe's Niggun" with the words of "Yetzaveh" in Yerushalayim in the 1950s, I believe. Some say that he did so because he had not heard this niggun when he came to Uman from his native Poland during his teenage years, and questioned Reb Avraham's mesorah from the Tcheriner Rov. Space Cadet: It has been a long time since you have been around these parts. We are all waiting for another guest posting. From the comment above, it is clear to all how much you have to offer! a quick note- Simply Tsfat is currently on tour in the US. Check their website simplytsfat.com for dates and location. I'm interested in the question about Bartok. Did anyone receive an answer. I was wondering if anyone knew of any connection between Bartok's music and the Nigunim or any of the Jewish Rumanian/Hungarian/Ukrainian music?